any of several plants, particularly abundant in prairie and steppe regions, that commonly break from their roots at maturity and, drying into a rounded tangle of light, stiff branches, roll before the wind, covering long distances and scattering seed as they go. 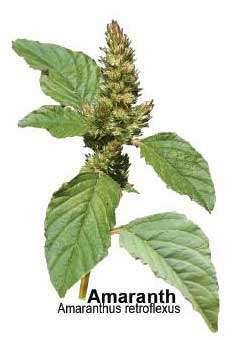 name for several weedy plants, particularly the common pigweed or lamb's-quarters of the family Chenopodiaceae (goosefoot family), the rough pigweed, or green amaranth, of the related family Amaranthaceae (amaranth family), and the winged pigweed, a tumbleweed. ..... Click the link for more information. , class Magnoliopsida, order Caryophyllales. Many varieties found all over the world. Super nutritious and healthy. Whole plant is edible. Can be eaten raw or steamed. Better tasting than spinach. 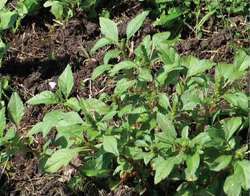 Has greenish, sometimes purplish colored flowers, red stem. Seeds are a world famous grain and food supply used by the Aztecs. Can be made into flour, or put into smoothies etc. Amaranth seed is high in protein, especially lysine and methionine, two essential amino acids that are not often found in grain. Very hardy plant, difficult to kill. An awesome food source. Used for stomach flu, diarrhea, gastroenteritis, excessive menstruation. Seeds better if soaked overnight. Roots can be roasted or boiled as potato alternative. Do not consume if pregnant or lactating. Toxic lookalike- hairy nightshade, whose leaves look the same but stem is hairy and has white nightshade flower. An annual plant (seldom perennial) of the genus Amaranthus that is distributed worldwide in warm and humid regions and is distinguished by small chaffy flowers (arranged in dense, green or red, monoecious or dioecious inflorescences) and by dry, membranous, indehiscent, one-seeded fruit. During Guy's journey to Jerusalem the play replaces the Saracen giant Amarant with a Turkish Sultan Shamurath and his diabolical counsellor Zorastes. The Amarant Trust can be contacted on 01293 413000 between 11am and 6pm, Monday to Friday. We got a renewal on our grant,'' program director Jeremy Amarant said. The Menopause Amarant Trust Telephone Helpline - 01293 413000 or website www. AMARANT TRUST is a research centre for women's health at the menopause and beyond. Malcolm Whitehead, director of the Amarant Trust, a support group for menopausal women, said the picture was far from clear. For more information on HRT contact the Amarant Trust's menopause helpline on 01293 413000 which is open from 11am-6pm, Monday to Friday. More than 40 treatments are now available and The Amarant Trust, an independent charity, has listed them all together in one easy read. Mapping the Menopause was conducted by NOP in conjunction with women's health charity the Amarant Trust. Sheer Kingston became the first stayer since Amarant in 1983 to win the Adelaide Cup/Brisbane Cup double, and connections, who had previously been reluctant to commit him to the Melbourne Cup, may now have a rethink. District Court in what had become a rather protracted legal battle," said Mark Amarant, CEO of STS. LANCASTER -- Palmdale School District SAGE Planetarium director Jeremy Amarant will talk about the stars and planets during a walk at 6p.